So says Geoffrey as an introduction to his life in East Africa. He goes on to talk about the social life in Nairobi, which was quite different from out at the stations, as described in the last post. 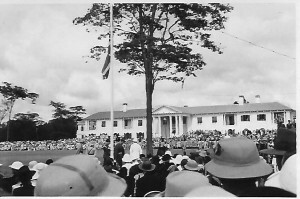 Everything was very formal, since this was one of the most important places in the British Empire. 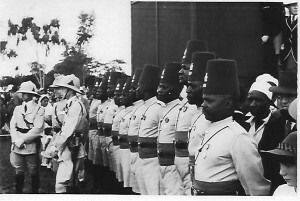 Later when he went to Khartoum, the seat of Government for Equatorial Africa, he found the formality overwhelming. Whether it was less formal here, or whether he was just a complete innocent, I don’t know. Maybe a bit of both. Standing up for the King’s Speech was something that survived for a while in our family, although I arrived a few months after the present Queen ascended to the throne. My memory is vague, but I think by the time the Christmas Message was on television, we were allowed to sit while watching it, but we still stood for the National Anthem afterwards. The anthem was also played in cinemas at the end of the evening’s programme, and on BBC television before close-down. At some time in the sixties we got away with nipping out before the anthem started, and it seemed to disappear altogether by the seventies. It is still played at the end of the Queen’s Christmas message on television, but since so much of her speech is leaked on the news beforehand, I think few people watch it. 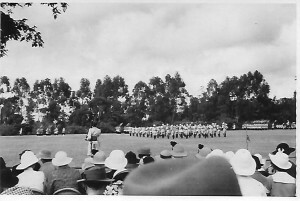 Back in 1936-37, though, all the colonial pomp was in full swing. I realise now that his journey out to Africa coincided with the constitutional crisis of Edward VIII’s abdication; King George VI’s accession had taken place ten days before he arrived in Nairobi. Geoffrey has one series of photographs of an event at the Governor’s Residence. I imagine it was the social event of the season. Some soldiers look to be receiving awards. 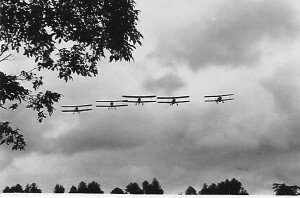 It could be a ‘passing out’ parade, of course, when trainees become real soldiers, but with the picture of the biplanes doing a fly-past, I wonder if it was to celebrate the coronation on 12th May – Geoffrey arrived back in Nairobi at the beginning of May after a couple of months running Mbeya (which I now notice is not in his summary of postings), and was posted to Lindi a couple of weeks later. Whatever you celebrate at this time of year, may it give you happy memories in years to come.